The entering freshman class at the Community College of Rhode Island (CCRI) for fall 2017 includes the first beneficiaries of a new program that offers free tuition to RI residents who in 2017 either were graduated from high school (public, private or homeschooled) or completed the General Educational Development (GED) test while younger than 19 years old. Students who begin the program can continue tuition-free for four semesters, enough to earn an associate degree, as long as they enroll full-time each semester, complete at least 30 credits per year and maintain at least a 2.5 GPA (on a 4.0 scale). The new free-tuition guarantee is an extension of the RI Promise scholarship program begun by Governor Gina Raimondo in 2015 and administered by the RI Office of the Postsecondary Commissioner that oversees the three state institutions of higher education, the University of Rhode Island, Rhode Island College and CCRI. There was no specific application process, and students who submitted their unified Free Application for Federal Student Aid (FAFSA) by the usual March 1 deadline in RI were automatically evaluated for eligibility and, if qualified, offered scholarships that could be accepted via an electronic attestation form on the CCRI website. 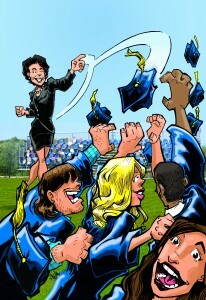 Raimondo has made the RI Promise scholarships a major priority, perhaps the defining priority, of her administration. “When I was a kid, you could graduate from high school and get a good job with a good salary to support a family. But that’s not the case anymore. In Rhode Island, it’s estimated that by 2020, seven out of every 10 [new] jobs will require some kind of education beyond high school. But right now, less than 45% of Rhode Islanders have that,” the governor told Motif. “This is also an economic development issue. Businesses want to be where they can hire good, talented people. Rhode Island already has a strong foundation in higher education – but college needs to be more affordable. According to RI Department of Education surveys of high school seniors, 90% of graduating students want to go to college, but only 65% actually do. And the number one reason students cite for not going to college is money.” The governor referenced her previous efforts improving college affordability, including making the SAT and PSAT free for RI high school juniors and seniors, and allowing students at participating public and charter high schools to take college courses for credit at no cost through the Advanced Course Network. “The Rhode Island Promise Scholarship was the next logical step in our work to increase opportunity for Rhode Island students,” she said. Most CCRI students qualify for other grant aid (that is, which does not have to be repaid like a loan), especially federal Pell Grants, and the RI Promise “last dollar” grant kicks in only after other eligibility has been exhausted: The net effect is that the free-tuition guarantee to the student is met at minimum cost to the state. Enright said that the 1,400 count includes “students who may actually have their entire education covered by the federal Pell Grant,” and who, therefore, would require no state funding from the RI Promise scholarship. Enright said that the “percentage of students in this cohort who are Pell Grant recipients, which is sort of a proxy for low income, [is] nearly identical” from last year to this year. Both Enright and Costigan started their vice presidencies on the same day, February 1, 2016, they said, and are just now putting innovations into effect that they have been planning for some time. “A huge piece of this is the vast majority of our students are first-generation college students. There’s an enormous amount of decision-making that goes into that, and coaching and support that will help a student along, so we’re increasing our advising staff to support that,” Enright said. Costigan said that “accelerated learning pathways” had been introduced so that students who needed a “developmental” course to prepare for a college-level gateway course “would have the option of taking both courses in tandem during the same semester, therefore cutting down a semester of coursework.” She said, “The research and the pilots that have been done nationally have shown very, very good outcomes with this, and our early data is also showing the same thing, that these students are successfully completing. CCRI is already making plans for fall 2018 entering freshmen. Their free tuition is already guaranteed to be funded, confirmed Catherine Rolfe, deputy press secretary to Governor Raimondo. Previous post: Got Beer? What’s Round and Orange and in Every. Single. Thing?